Assess the marketing spend return by comparing your customer acquisition cost (CAC) to your customer lifetime value (CLV). When you acquire a new customer you are not obtaining the odd sale, but a customer that will carry on purchasing from you (let’s hope!). Then, it is important to assess not only the first sale value but the full value: this is the customer lifetime value, or CLV. If you want to evaluate the return of your efforts you better compare the value of the customer to how much did it take to acquire it. 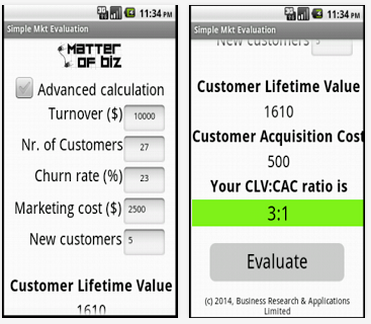 That is when you should be estimating the customer acquisition cost (CAC). Values of 1:1 or lower (p.e. 1:2) are considered to be wasting resources., while higher values (i.e. 2:1) express a balanced marketing strategy. One has to take care and not take this value to higher than 3:1, since higher values may imply underinvestment in marketing, which could harm future growth. In order to help you estimate this relationship you can use our Android app: Simple Marketing Evaluator.